15x30 yard grid, each Players in groups. - Players juggle in a specific pattern or sequence. 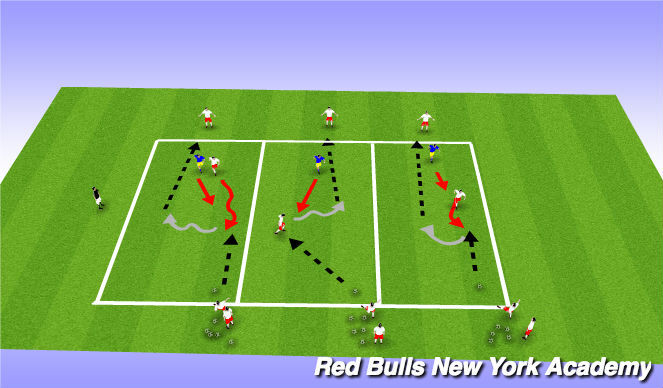 - Defender must start the play behind the attacker until the ball is passed. - Attacker checks away first to create space. - As Attacker makes eye contact/connection with Passer, look to check back towards the ball. - Passer plays ball into the feet of the Attacker who looks to spin the Defender. - Attacker plays the ball into the feet of the Target who dribbles back to become the Passer. - Rotation: Passer - Defender - Attacker - Target. Half Way line is the retaining line. 2v2 in each half of the field. 2v2 in each half of the field.